the soup looks fantastic. I have never thought about using chickpeas in that way before. love the fire roasted flavor in the soup too. it just looks delightful and I can’t wait to try it- maybe with a nice big grill cheese alongside to dip in it! he, he, he… we had it with a nice grilled cheese sandwich, I even took a picture, but it didn’t turn out very good… great minds eat alike! I love the color! What a great recipe. Love the bright swirl in the center of the fire – bien-réussi! The chickpeas are great here, making this soup a meal… lovely. I usually don’t buy the regular tomatoes from Muir, but their fire roasted, wow! Love them! This looks like a lovely soup, Sally. I wouldn’t have thought of putting chickpeas in a tomato soup, although I have cooked plenty of chickpeas in tomato-based sauces. Lovely healthy soup. I make something similar with chickpeas and baked squash which is an adaptation of an Indian lentil (dal) soup. It uses either tomato paste or ground tomatoes. Hummmmm… chickpeas and baked squash for a soup, that’s a great combo! Here’s the recipe in case you want to take a closer look. If you use vegetable stock, the dish is vegan. Chop the onion and garlic and saute in hot oil for 5 minutes. Add spices and cook for 2-3 min. Add tomato paste (or crushed tomatoes) and cook additional 2-3 min. Add cooked squash, stock, water and chickpeas. Bring to boil and simmer for 10-15 min. Puree using wand blender or in batches in regular blender or food processor. Strain through a coarse sieve to get out any chickpea skins or stringy bits of squash. Note: I used an acorn squash that I had baked and scraped out the contents but you could use butternut etc. I ended up using 2 beef bouillon cubes and 4 cups of water since I had no stock of any kind. If you’re desperate, you can use water. The original recipe called for 1 400 gm can of tomatoes. If you have fresh tomatoes, blanch, peel and seed and add about 2 cups’ worth. I was going to use red wine vinegar but couldn’t get the foil cap off the new bottle so I used white. If you don’t have any wine vinegar, use lemon juice to give you that bit of zip. Thanks so much! That goes into my computer right away for future reference! This is a fantastic idea.. outstanding food to go along with an outstanding way to raise money for a good cause! I love that this is “fire roasted”..
everything should turn bright green soon, awesome! What a wonderful cause and this is a great soup. Looks delicious. 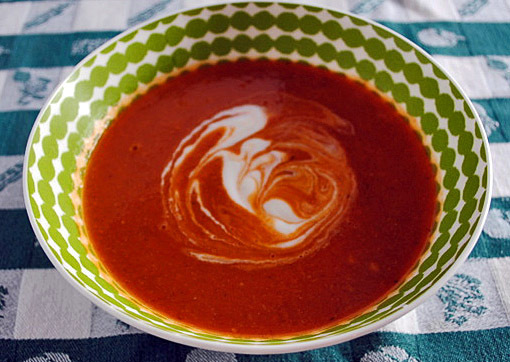 I’m a new chickpea fan, and tomato soup is one of my all time favorites! Your soup looks divine! Thanks for participating in my event! Pingback: Second Annual Heart Healthy Roundup! | The Jey of Cooking. What a fantastic idea..I love the color!